If you run a business enterprise, it is a common act that you indulge in a meeting with other branches. But what do these meeting will accomplish if you cannot clearly hear anything the far distant colleague of yours has to say. These wireless Bluetooth enabled speakerphones to let you take audio conferences to a whole different level. So, all you have to do is to connect one of these to your phone and discuss all your business plans in a much better manner. Apart from its business perspective, you can use these to play your favorite music too. 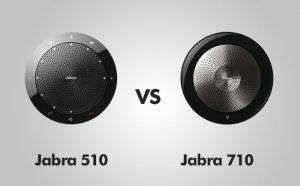 Here is an unbiased comparison between two of the top guns in the speakerphone segment – Jabra SPEAK 510 and Jabra SPEAK 710. Jabra 510 has a pretty sleek and classy design. All-black and brushed metal theme looks very catchy. It has a nice small yet strong design, you can carry it wherever you like. The control buttons on the device are placed in a nice manner and light of these buttons are very clear and tactical which makes the device easily accessible even in low lighting. The only problem in its design is that it has a microphone located below the power button which makes it directional speakerphone instead of being Omni-directional which is a major setback. Also, the USB plug which is lingering out of the device kills its overall designing perks. Jabra SPEAK 710 is the perfect match for your high-end business conference. The design of this wireless device is just a work of art as it has got both the style and class right up to the mark. This device has dedicated ports for connecting it to the master device. Its lightweight design makes it ideal to carry it from one place to another and it also comes with a very handy protective Travel Pouch. The back stand of this Bluetooth enabled speakerphone gives you the freedom to use it as per your own requirements, you can use it in either the sitting position or you can use the back stand to concentrate the audio in one direction. This helps when you are in the mood of playing some music to soothe your mood. In terms of sound quality, Jabra SPEAK 510 is very impressive as it can catch and respond to frequency from 250 Hz to 14 KHz in music mode and from 250 Hz to 7.5 KHz in conference mode. It carries the technology of Bluetooth 3.0 which helps this device to produce better sound quality. This wireless device is made to make sure that the meetings are efficient and conversations are clear, Crystal HD voice ensures that the sound does not echo or distorts even at high volumes. This wireless speakerphone carries a very crisp and deep audio output which makes it ideal for big conferences. As these devices are not just for audio output, the microphone on this device is pretty good as well and catches even the slightest noise in the room, as the microphone is placed in the mid of this device, it makes this speakerphone Omni-directional. The usage of Jabra SPEAK 710 is not just limited to merely regular conference meetings; it produces a Crystal clear sound even at high volume and can also be used as a music speaker whenever you need it to be. Jabra Speak 510 is a device that leaves no room when it comes to features. This device has a whole lot of interesting stuff to offer. The speakerphone carries a Lithium Polymer battery which ensures that the battery on this product will last long up to 15 hours. It is a perfect plug and plays solution for anyone who is in a need of wireless speakerphone. This device is compatible with almost any device and gives an optimized UC experience. Jabra 510 supports Microsoft Skype and is a great ally for video conferences. The control buttons offered are very handy and help a great deal as you have to mute and unmute several times in a business call. This small pack carries a whole bunch of features as for starters, you can pair two Jabra SPEAK 710 wireless speakerphones if you need a surround sound experience which comes very handy when you have to organize big conference meetings. With its long lasting battery backup, there is no need to worry about losing juice while of a call. It can be personalized with MS Cortana, Google Now or SIRI to experience a better digital assistance and all this within your reach with just a single touch. It offers In-room coverage for up to 6 peoples at a time so you do not have to keep your thoughts at bay until your colleague is talking. Moreover, if you pair it with another Jabra SPEAK 710 you can max out the limit up to 12 peoples instead of 6. PROS: Bluetooth range up to 100 meters / Noise canceling microphone. PROS: Can be paired for surround sound experience / Great for Music. CONS: Does not support personalized Assistant control / directional microphone. CONS: LED visibility issue / random glitches while connecting. To choose between these two amazing Bluetooth enabled speaker phones, Jabra SPEAK 710 is a definite winner as not only it is good with music but also it supports more people and has a better sound production system with much clear and loud audio output. While the Jabra SPEAK 510 has an upper hand in terms of design with its bright LED buttons, it loses its charm because of being suitable for a directional usage. Needless to mention how handy things become when you get AI assistance in your device and this is where Jabra SPEAK 710 shines as it brings you the best out of it because the AI technology used in it is optimized very nicely.